Like many people in Great Britain, I have gone from a vague interest in the Olympics to being fascinated by sports which I hadn’t even heard of ten days ago! We have all been moved by the determination, hard work and courage of the athletes, regardless of whether they won a medal or not. Let’s remember that competing in the Olympics is an achievement in itself. So many of the athletes have thanked their support team – their coaches, physios, dieticians… Make sure you have a great support team of specialists and take their advice. It might be your accountant, your partner, your marketing adviser – build a team who believe in you, understand your business and have the specialist knowledge that you don’t have. If you read the stories of these athletes, they have all had their set-backs but have persevered. Heptathlete Jessica Ennis could not compete in the Beijing Olympics due to three stress fractures in her right foot. She has had to re-train herself to take off for the long jump on her left foot. This hasn’t stopped her winning a gold medal four years later. All successful businesses have suffered setbacks, so we need to learn from them and move on. Many have asked what is behind the success of British cyclists in recent years. The answer is Dave Brailsford, performance director for British Cycling. As Jeremy Wilson in the Daily Telegraph said “There is, quite simply, no more impressive coach or manager in world sport….Brailsford obviously has many qualities, from his eye for the small detail, or what he calls “marginal gains” to an ability to appoint and delegate work to his team of experts.” We have mentioned getting a great support team, but the “marginal gains” is also something we can learn from in business. As a marketing mentor and trainer, my clients often want a silver bullet to solve their marketing issues, but it is often making small changes which add up to a big difference – from a different subject line in an email campaign to how enquiries are recorded and followed up . In the women’s triathlon, we saw Lucy Hall lead the swimming and cycling, to set the pace and tire others so that team mate Helen Jenkins could save her energy for the running, her own strength, leading Helen to 5th place. This was a great achievement for Helen when she had been injured not long before the race, and Lucy played her part in this too. We all have competition, but sometimes we should consider working with them rather than against then. Co-operation could lead to getting bigger projects, learning from their strengths, and using your different strengths to build a stronger team. Each of the athletes has their own strengths and uses them. Are you a heptathlete, built for a wide range of events, or is the long jump really your strength? Focusing on what you do best (and getting help in your weaker areas) will give you the Unique Selling Point you need to get ahead. Jessica Ennis still turns out for her local club, City of Sheffield Athletics Club, even though it is in division 3 of the northern league. When you have achieved success, don’t forget your roots, and those who helped you, and be willing to help others. It is heart breaking to see the disappointment on the athletes faces when they haven’t achieved the success they were hoping for, but each one needs to remember that taking part in the Olympics is an achievement in itself. We also need to remember that running a business in the current climate is an achievement, and that many would not have the courage to do that either. 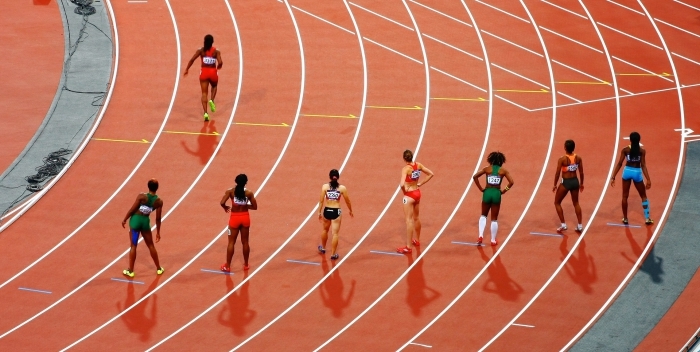 So let the Olympic athletes inspire you to do greater things in your business!